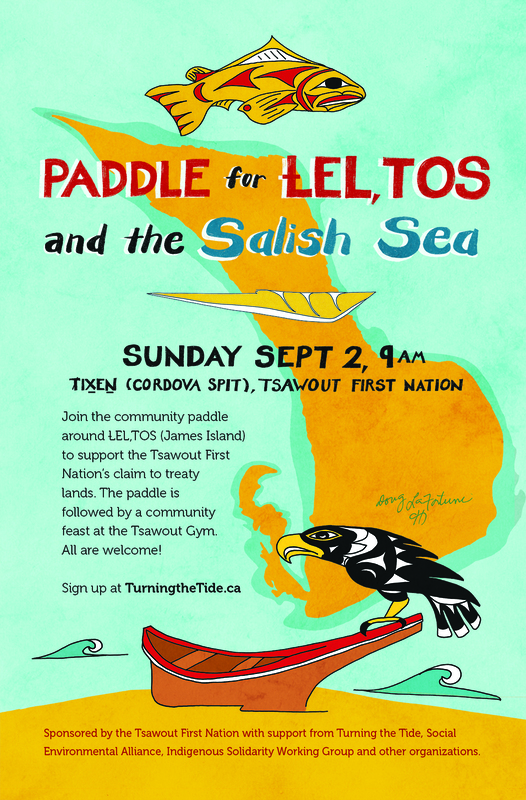 Turning the Tide is an ongoing public awareness campaign culminating with a multi day human powered journey through the Salish Sea. Our goal is to build organizational capacity and links of solidarity among concerned citizens in coastal communities. We see this campaign as a piece to a larger movement to protect our coastal environment and resource economy and build a broad-based mass movement focused on building solutions beyond the petroleum based economy. In planning the inaugural Peoples’ Paddle for the Salish Sea in 2014, we started by talking with the local Songhees First Nation, with Chief Ron Sam indicating his support. We have also worked closely with members of the W̱SÁNEĆ Nation and we are reaching out to the other environmental, outdoor recreation and social justice groups active in BC to unite and grow the movement to protect our coastal waters and communities. We hope to build upon the links created through this experience, identifying potential organizers and groups we can work with on an ongoing basis to further our broader goals of social transformation to a post-carbon economy. The annual paddles since our founding in 2014 have been remarkable experiences for all involved, nurturing a community of paddlers with new opportunities for culture, recreation, learning and athletics on the islands. In 2018, we are building on this momentum, mobilizing public support for Tsawout First Nation’s assertion of rights to LEL,TOS (James Island) in a shared journey in the Salish Sea. Safety is of course the first priority. In planning the on-the-water action we are ensuring all necessary safety precautions are being implemented including notifying the coast guard and maintaining set ratios of experienced guides and beginner paddlers as well as including lifeguards in the swimming contingent. Turning the Tide’s ongoing campaign and its centrepiece political action are designed to inspire regular people to take action. For some, that might mean coming to a meeting and writing a letter or perhaps signing a petition. Maybe they will join us for our educational events on the islands. For others that will mean taking the plunge and engaging in a long range open water swim. No matter what the specific action they take in the near term, we hope to engage people and mobilize them on an ongoing basis to build solutions beyond the petroleum economy, contributing toward a growing movement to protect our coastal waters and communities.